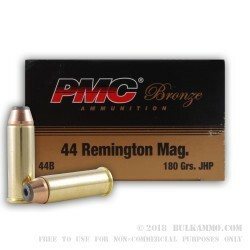 A 1000 round case of premium semi jacketed hollow point 44 mag ammunition loaded in a 180 grain .44 Magnum configuration by PMC. The Poongsan Corporation of South Korea is producing ammunition that the American Shooting Market has come to love over the past several decades. Part of the line that has endeared the brand to shooters in America has been this tried and true configuration of .44 Magnum ammunition. This is a throwback on the surface but loaded to modern specifications on modern machinery by a company that is at the top tier of manufacturing in their space. Poongsan is an ISO certified operation that manufactures brass, bronze, copper and lead. They have robust stamping and die cutting operations that include production of bass cartridge cases and projectiles. The company is in a unique position to pass savings onto the end user consumer. 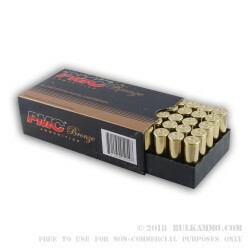 Part of the legacy of the PMC brand in the United States has been that it is priced well from a value perspective and is a very good performer. The classic big bore self-defense load of the 1980’s and 1990’s is this .44 Remington Magnum with a soft point hollow point configuration and a semi-jacketed skirted base on a 180 grain projectile. Combined with the value and high quality of the brass casing and Boxer primer which makes it reloadable, this is a very nice contender for your shooting dollars.